Prime Minister visited Agartala today in the third and final leg of his day long tour to Assam, Arunachal and Tripura. He inaugurated Garjee – Belonia Railway Line and several other development projects in the state. Prime Minister unveiled the statue of Maharaja Bir Bikram Kishore Manikya Bahadur at Maharaja Bir Bikram Airport, Agartala. Lauding the role of Maharaja Bir Bikram Kishore, he said that Maharaja had a vision for Tripura and he contributed greatly to build the city of Agartala. PM said that he felt proud to unveil his statue. 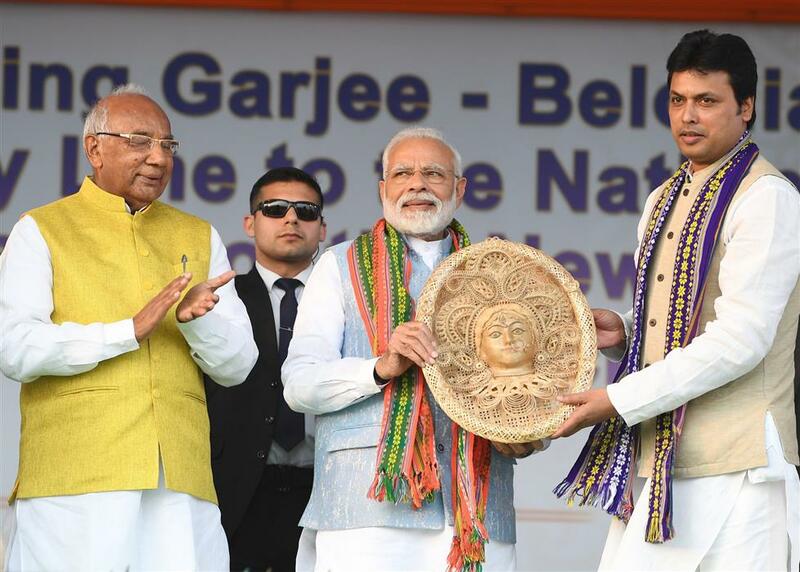 About the development in Tripura, PM told that the progress is now on a new trajectory. Government has allocated enough funds over the last four and a half years for the development of Tripura. He said that he heard that for the first time in history, crops were procured on MSP prices. PM dedicated to the nation Garjee – Belonia Railway Line through unveiling of plaque at Swami Vivekananda Stadium here. This line will boost Tripura as the gateway to South and Southeast Asia. He inaugurated the New Complex of Tripura Institute of Technology at Narsingarh. During the event , PM recalled that during elections when he came here, he advocated about HIRA model of development i.e Highway, I Way, Railway, Airway. Agartala Sabroom National Highway, Humsafar Express, Agartala Deoghar Express, New Terminal at Agartala are part of this model. Speaking about the cleanup of ghost beneficiaries, PM said that earlier the development existed only on paper. He added that “I heard that there are around 62000 beneficiaries in Tripura alone. These people were taking your money.” However, over the last four and a half years around 8 crore ghost beneficiaries have been taken out of the system. 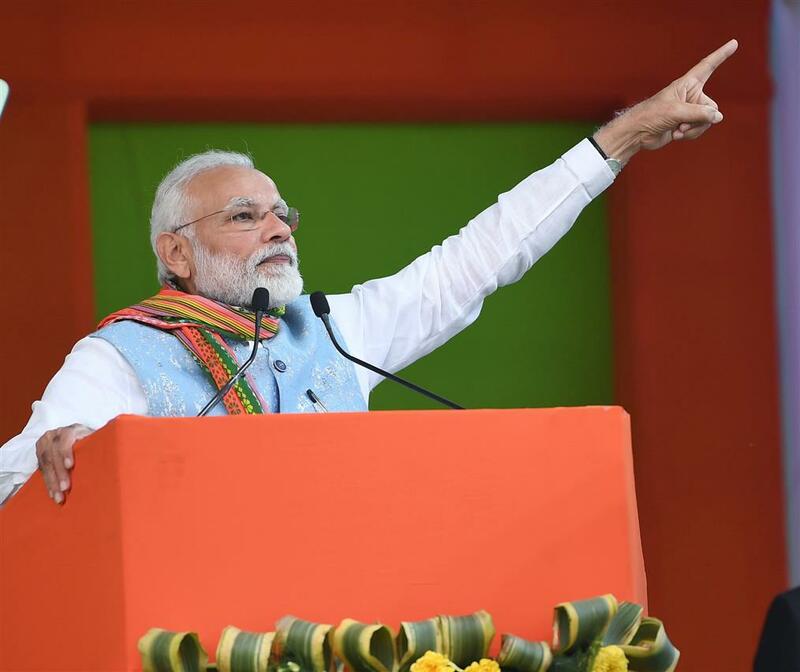 Underlining his commitment towards the farmers and informal sector, PM said that through Pradhan Mantri Shram Yogi Mandhan Pension Yojana, labourers in unorganized sector after 60 years of age will get Rs.3000 per month as pension. Through PM Kisan Samman Nidhi Yojana, farmers with less than 5 acres will get Rs 6000 per annum in their bank accounts. Separate department for Fisheries will greatly benefit the fishermen. These steps are a reflection of the intent of the Government, he added. Prime Minister returns to New Delhi after the day long visit to the three NE States. He will be visiting Andhra Pradesh, Tamil Nadu and Karnataka tomorrow. ये फर्जी लोग आपका पैसा लूटकर किसकी तिजोरी भर रहे थे?